Today marks exactly 20 years since Prime Minister Tuilaepa Sa’ilele Malielegaoi was sworn in as Samoa’s sixth Prime Minister when his predecessor Tofilau Eti Alesana stood down due to ill health. Our reporter Soli Wilson talked to members of the public yesterday to get their views on the performance of the P.M. to date. I personally think that the Prime Minister has been doing a good job since being in office, for 20 years now. He is the reason why we’ve developed so much as a country over the years. If it wasn’t for him, we wouldn’t have a new hospital, new airport plus all the projects in progress right now. These are all great signs that he is doing a lot for Samoa as our leader. From the moment Tuilaepa was appointed as Prime Minister, our country went through many big changes – good changes. So much has improved, in terms of infrastructure, businesses, education and the people’s standard of living. He gets blamed for so many bad things by so many people across the globe, but not from me. I would like to thank our Prime Minister for all his good works he has done for Samoa and its people. From my point of view, I think the Prime Minister and his political people look down on those with lower status than them. Otherwise, he’s probably just doing his job. In terms of the corruption issue; there is corruption everywhere in the world, so there is no surprise there’s a lot of it here too. This is a result of all the changes and the influences coming into our country. 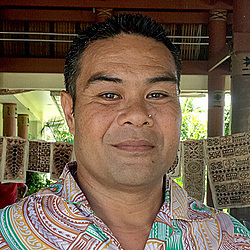 Yes change is inevitable but that’s what mostly attracts the tourists – the original Samoa. I have not been in our country for long so I do not fully know anything about Tuilaepa. I have heard people who judge, criticize, say negative things and are against the things he does but I’ve also heard a lot of people say that he is a great leader doing a great job for our country. Personally, I believe he is a very good leader, because he cares for our people. This man has been serving our country for 20 years now, and although so many people hate and criticize him for what he does and how he does his work, I personally think that he’s done a lot of good for Samoa. Because in truth, if he was such a bad leader, there wouldn’t be any significant improvements nor would there be peace and security in our country. Yes, we have problems but we are happy. Our Prime Minister Tuilaepa still has my full support.